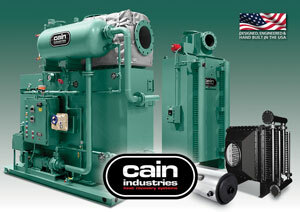 Cain Industries is a leading designer and producer of combustion exhaust heat transfer products. 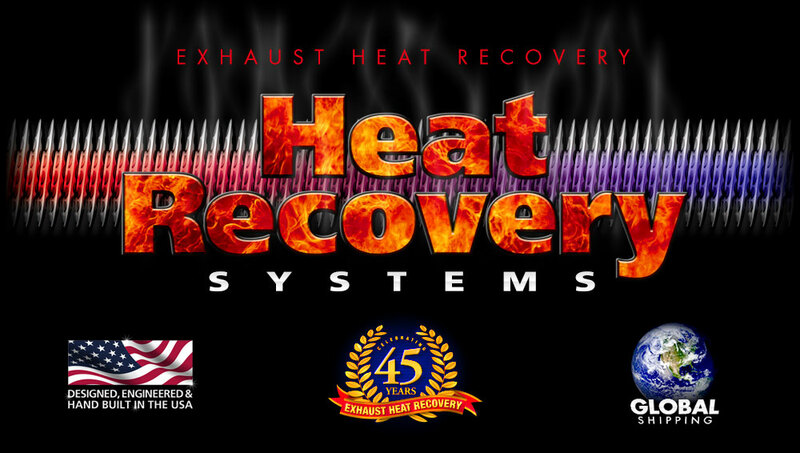 Celebrating 4 decades in business, our success in lowering fuel costs and related pollution makes Cain the first choice for both combustion retrofit and OEM exhaust heat recovery applications. We are the only manufacturer producing a complete spectrum of exhaust heat transfer and steam production equipment for the gas and diesel engine cogeneration (CHP), boiler exhaust economizer, industrial combustion heat recovery and spiral finned tubing markets. Cain Industries has developed 16 complete product lines with over 3,450 standard models for the correct choice in recovering BTU from exhaust applications. 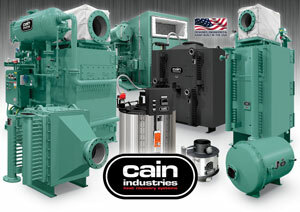 Cain Industries is your single source for boiler economizers, condensing economizers, condensing heat exchangers, waste heat recovery systems, waste heat boilers (WHB), industrial heat recovery units (HRU), heat recovery silencers (HRS), feedwater heaters, heat recovery steam generators (HRSG) and exhaust steam boilers. Please complete an online RFQ, email or call us at 262-251-0051 (800-558-8690 toll free) to request your free exhaust heat recovery savings analysis study and quotation today! It is a fact that a minimum of twenty cents of every fuel dollar is wasted, when instead, much of it can be recovered. 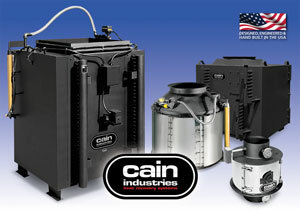 Cain Industries recovers the heat and transfers the usable BTUs to water, glycol, special fluids or steam. Listed below are some of the combustion sources that would benefit from a Cain heat recovery system. Since 1978, Cain Industries has produced high quality waste heat transfer products. We are dedicated to the reduction of fuel usage and pollution worldwide. Our expertise makes us the natural choice for both the retrofit and OEM client. We set ourselves apart from others by producing products to serve a broad spectrum of markets: the Diesel and Gas Cogeneration market, the Boiler Exhaust market and the Fume Incineration market. As the only manufacturer in all of these markets, Cain Industries has the greatest selection of products and system applications available. We have become leaders in this industry by replacing old technology with the most recent technological advancements. Using elaborate computer programs, Cain Industries has developed and manufactured twelve product lines with over 3,500 dependable heat transfer products. Our unique designs increase efficiency and performance, while making installation, service and maintenance more cost effective. We are also dedicated to a primary investment in our associates, their manufacturing technology, quality improvements and innovative cost reductions to meet the customer’s budget. It is by these means that we will achieve absolute customer satisfaction. The success of Cain Industries is a direct result of our simple philosophy: to produce the highest quality products and provide unmatched customer service. The words “safely and economically recover waste heat” also mean “no-risk return on investment” which is exactly what Cain Industries heat recovery systems represent. By installing a fuel saving economizer on a combustion source, the BTU recovered pays for all the equipment installed, usually in 12 to 18 months (or an equivalent return on investment of 75 to 100% annually). This means recapturing approximately 50% of the wasted $$ for every fuel dollar spent. The exact payback period for your installation will depend on local fuel costs and the number of hours of usage. Internal stainless steel exhaust bypass for stack corrosion control, tempering exit temperatures and/or protection against exhaust backpressure buildup due to fouling. Stainless steel hinged access doors for ease of routine inspection and/or cleaning. Quick release adjustable tension latches requiring no tools to open access doors. Click here for additional fin tubing information. No weld/removable tubes with no pressure welds in the gas stream make for easy tube replacement. Round or rectangular design configurations as standard model selections. Custom computer design for special multiple order OEM requirements. 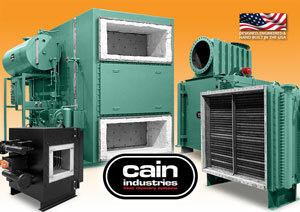 Depending on the application, Cain Industries offers a variety of ancillary equipment, such as timed automatic sootblowers, factory insulation, circulating pumps, thermometers, remote indicating controllers, modulating damper actuators and stack-to-economizer transitions to meet the needs of each specific installation. Upon review of your application, you can expect our proposal within 48 hours. It will include professionally engineered details showing equipment costs, savings analysis, computer-generated economizer performance, cad dimensional drawings, flow schematics, warranty and performance guarantee. The selection of a Cain Industries economizer results in the most economical design to install and maintain. Design advantages such as compactness and lightweight construction allow for installation at the very lowest cost. All economizers are guaranteed to meet or exceed the anticipated performance specification. 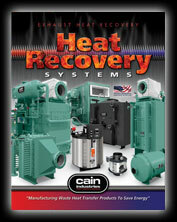 A PDF brochure highlighting Cain Industries exhaust heat recovery product lines. 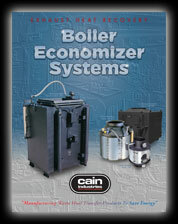 A PDF brochure of Cain Industries Boiler Economizer exhaust heat recovery systems that include models: RTR, FCR, EM, CXL and DXL. 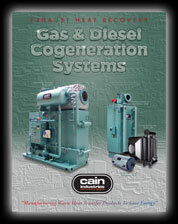 A PDF brochure of Cain Industries Gas & Diesel Cogeneration exhaust heat recovery systems that include models: ESG1, HRSR, HRSA, UTR1 and UTR. 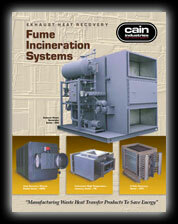 A PDF brochure of Cain Industries Fume Incineration exhaust heat recovery systems that include models: ESG, HRSR, ITR and UTR1. 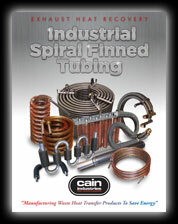 A PDF brochure of Cain Industries spiral finned tubing for exhaust heat recovery in extreme temperatures. Copyright ©2019 Cain Industries. All rights reserved.